The Hotshots are now one win away from getting back to the PBA Finals since the 2013 – 2014 Grand Slam Championship under the name of San Mig Super Coffee Mixers and coincidentally coached by now Ginebra coach Tim Cone. Game 5, was witnessed by thousands of fans inside the Mall of Asia Arena in Pasay City, Raffy Reavis leads the Hotshots in scoring and rebounds with 17 points and 13 boards, Barroca, Lee and Maliksi scores 12 points, 10 points and 10 points respectively to help the Hotshots of taking Game 5. Third Quarter is the turning point of the game where the Hotshots scores 22 points compared to Ginebra’s only 10 points to end the quarter 67 – 55 Hotshots by 12. Ginebra rally’s back in the 4th quarter cutting the Hotshots lead into 7 but unable to stop the most eager team Star Hotshots. Game 1, 2 and 5 was taken by the Hotshots, while Ginebra took’s Game 3 and 4. Game 6 is scheduled for Sunday Feb. 19 at Smart Araneta Coliseum 6:30 pm. Will the Hotshots returns back the glory days of returning back in the Finals? Or will the Ginebra's "Never Say Die" extends the series into decisive Game 7? The rivalry between the Hotshots and Ginebra was dated back in Patrimonio/Jaworski era, James Yap/ Mark Caguioa era and now Paul Lee/ LA Tenorio era. Every time these two team meet fans are never hesitating to witness these two power house team and two of the most popular teams in PBA’s History. 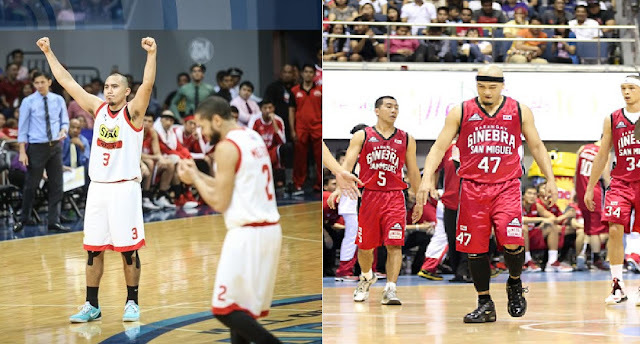 The match between Star Hotshots and Barangay Ginebra was dubbed today as “Manila Classico”. No Comment to " Hotshots One Win Away of Getting Back To the PBA Finals "